Why does almost every digital signage newbie think digital signage is just a more expensive way to create printed ads? And why do they find themselves so focused on the price as opposed to the value that digital signage can have on their business? It’s time we look at the value and ROI that digital signage can bring to your organization, and we’re sure that after you read this post, there will be absolutely no reason you won’t consider digital signage for your business. Today, most business owners, including your competitors, are aware that they should be using digital signage to engage their customers in a cost-effective manner. Although it requires an upfront investment, this has significantly decreased over time thanks to inexpensive software and low-cost media players. To put it simply, the initial investment comes with an impressive ROI. 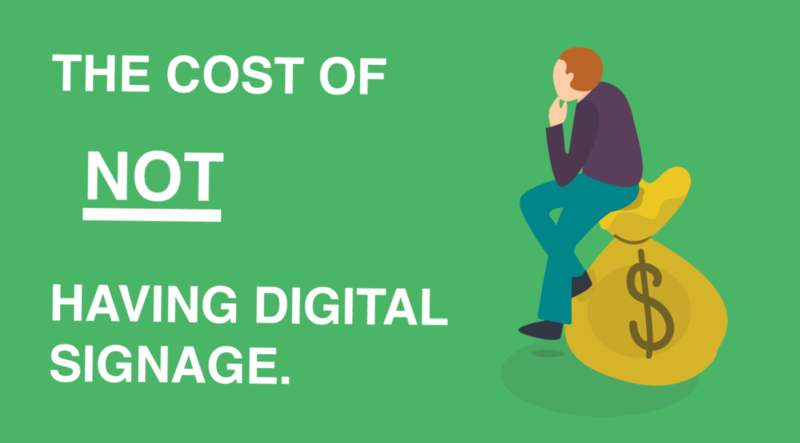 Before you can understand the cost of failing to implement digital signage, it’s important to familiarize yourself with the benefits that come with digital displays. Producing traditional print signage is often a time-consuming and expensive process. Once your material is published, it’s there to stay even if it quickly becomes outdated. On the other hand, digital signage content can be updated almost instantly, allowing you to showcase real-time information. Need to change important event details? No problem. Want to stream photos from Instagram or Google Photos? Easily done. Since digital signage enables messages to be updated in real time, content can be hyper-targeted based on world events, audience interests, or even weather conditions. For example,a cafe can promote offerings depending on the weather that day. If it’s an unusually warm day, they can promote iced drinks, or hot drinks when the temperature drops. Digital signage is also an excellent way to offer promotions or discounts which help drive sales. Benefits of digital signage don’t only include efficiency and improved brand recognition. Compared to print-based advertising, digital signage is much more environmentally friendly. As soon as your printed campaign comes to an end, there's usually a considerable amount of material waste. The implications of this waste, several times a year, is much more substantial than setting up a digital signage network at your location. Although we’re not saying digital signage is 100% eco-friendly, it’s surely a huge improvement on print based advertising methods. If you’re concerned about disposing of computers, look up a local charity which accepts used displays and computers which can be reused for other purposes. Our inherent decision-making powers are strongly influenced by the visuals we’re presented with, and your digital signage is no different. Often it’s the first (and arguably most important) interaction customers have with your business, and it can have a lasting impact. 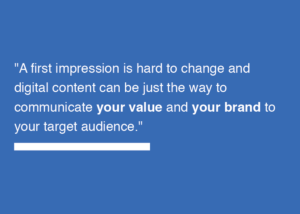 A first impression is hard to change and digital content can be just the way to communicate your value and your brand to your target audience. Before you even sell anything to your customers, you need to grab their attention, and digital signage is a powerful way to do so. In fact, a 2012 survey commissioned by FedEx found that 76% of American consumers would enter a store that they’ve never visited based solely on the appeal of its signs.The same goes for the opposite, as poorly designed signage, whether it’s static or digital, can be particularly unappealing and can drive away future customers and hurt your brand. 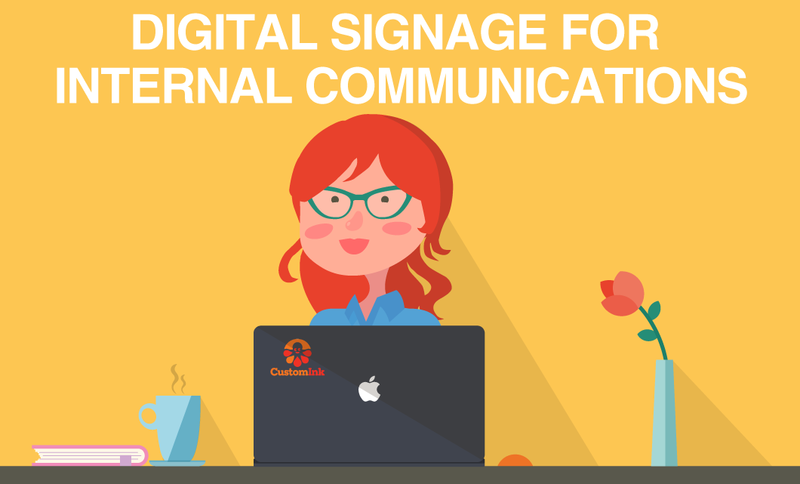 Now that we’ve seen the benefits of digital signage and why it should be the foundation of your visual presence, we think it's safe to say that compared to traditional signage, digital signage comes with a host of considerable advantages. Despite all of these advantages, you may still be suspicious of the time and effort required to implement a digital strategy since you’re so comfortable with the traditional methods you have been using to date. It’s no secret that as a society, we are bombarded with information on the daily, and we’ve learned how to ignore certain things to minimize the distractions in our daily lives. Traditional print advertisements are something we rarely pay attention to since they tend to be the least exciting. Despite this information overload, large TV screens and displays remain hard to disregard and can quite easily grab our attention. Even if a customer doesn’t read everything on the screen and pay attention to the smallest details, there’s a huge difference between taking notice and completely disregarding your message. This difference can go so far to help impact sales and brand recognition, which is no small feat. Imagine you own a small flower shop, with events, classes and special offers to promote throughout each month. In the past, it may have been enough to only post this information on a bulletin board at the entrance of your store. Perhaps you even took the extra step to print out small flyers and strategically place them in coffee shops and libraries in the neighborhood. Today, however, we are living in a digital age, and you can’t rely on a few pieces of paper to grab the attention of potential customers who have so much competing for their attention. To make matters worse, your competition has likely already added some digital signage and is actively promoting their events and promotions. As long as your content is well designed, the cost of getting your audience’s attention is well worth the investment. This opportunity to engage and attract just can’t be missed. Digital signage requires an investment. The bottom line, however, is that if it’s executed properly, this investment is much less than the missed opportunity cost of not having a way to engage your customers. This sort of promotion is no longer a mere novelty: it’s what your customers expect when they venture out into the marketplace. Now that you’re ready to get started with digital signage check out our free digital signage templates.